Director: Oliver DalyWriters: Oliver DalyStars: Alex Neustaedter, Becky G, Alex MacNicollSummary: A.X.L. is a top-secret, robotic dog created by the military to help protect tomorrow's soldiers. Code named by the scientists who created him, A.X.L. stands for Attack, Exploration, Logistics, and embodies the most advanced, next-generation artificial intelligence. After an experiment gone wrong, A.X.L. 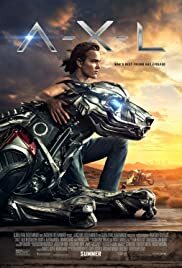 is discovered hiding alone in the desert by a kind-hearted outsider named Miles (Alex Neustaedter), who finds a way to connect with him after activating his owner-pairing technology. Together, the two develop a special friendship based on trust, loyalty and compassion. Helping Miles gain the confidence he's been lacking, A.X.L. will go to any length to protect his new companion, including facing off against the scientists who created him and who will do anything to get him back. Knowing what is at stake if A.X.L. is captured, Miles teams up with a smart, resourceful ally named Sara (Becky G) to protect his new best friend on a timeless, epic adventure for the whole family. This entry was tagged 2018, A-X-L แอคเซล โคตรหมาเหล็ก, พากย์ไทย. Bookmark the permalink.